Cheap, fast, solid, and small. 1/8” hardboard and a piece of gorilla (duct) tape. 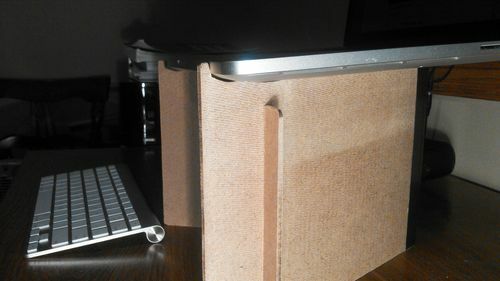 My neck hurt from always staring down at my computer on the desk so a quick google search yielded some options and I saw one like this but made of cardboard. 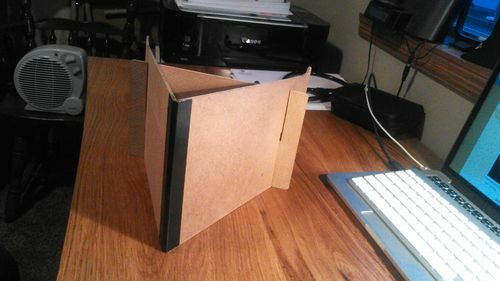 I made a cardboard template and then the hardboard version. It has a slight forward slant to make using the built-in keyboard and trackpad a bit easier when you need. 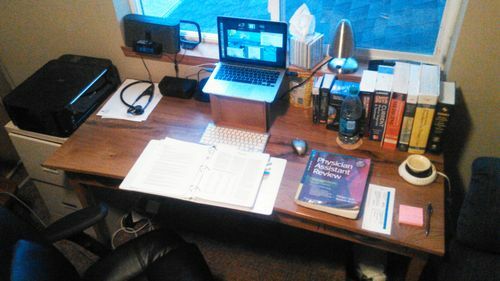 But if you’re doing this for ergonomics you’ll fix one issue only to gain another if you don’t have a keyboard and mouse on your desk. Otherwise your shoulders and arms will pay having to reach up to use the built-in hardware. ‘nuff said. Watch video for dimensions. Thanks for looking, hope it helps someone else too! Hey Grant. Good job. Hope life is good for you and your wife. Hey Monte, busier than ever, baby boy due may 26th! Hope all is well with you too!